Daniel Riggs Huntington was born in Newark, New Jersey on December 24, 1871 and spent his early life in New York City. He was educated at Columbia Grammar School, a preparatory school for Columbia College/University. Huntington began his architectural career in 1889 in Denver Colorado, initially working as a draftsman for the architectural firm of Balcomb & Rice. In 1894 he returned to New York and took a job in the office of W. Wheeler Smith, working there for six years. Around 1900 he returned to Denver and formed a partnership with fellow Balcomb & Rice draftsman, William E. Fisher. Together they designed several Classical Revival style homes across the city including the grand Smith Mansion (1902). For reason unknown, he moved to Seattle in 1905. By 1907 Huntington had formed a brief partnership with James H. Schack. Work of the Schack & Huntington firm included several residences, and the First Methodist-Episcopal Church (1908); the Mines Building (a.k.a. Oriental Building) for the Alaska- Yukon-Pacific Exposition (1908, demolished); the original Arctic Club Building (Morrison Hotel, 1909); and the Delamar Apartments (1909). After Schack and Huntington parted ways around 1909, Huntington continued working independently for a few years. During this time he designed the Shumway Mansion in Kirkland (1910) and the Sanitary Market (1909, destroyed). He shared credit for the latter structure with his talented draftsman (and soon to be partner) Carl F. Gould. As Huntington & Gould, the two men completed a number of mixed-use buildings and several houses including a home for Mrs. E.H. Shumway (1910); and the David Newbrand House (1911) both in Seattle. In 1912, Huntington formed a brief two-year partnership with Arthur Loveless and together they designed several residences and apartment buildings around the city. They also designed at least one building in Juneau, Alaska; a two-story frame building (1913). 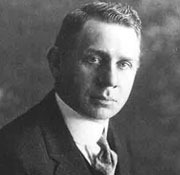 In September of 1912, Huntington was appointed as the City Architect for the City of Seattle, a position he held until late 1921. During this period he is credited with the design of numerous public projects, including several Seattle City Light projects such as the Lake Union Steam Plant (1912, 1914, 1917, 1921);; the Wallingford Fire and Police Station (Station No. 2, 1913); Firlands Sanitarium (1914); the University, Freemont and Ballard Bridges (1919); several fire stations including station No. 33 (1914), station No. 12 (1914), station No.2 (1920), and station No.7 (1920). His last project with the city was the Fremont Public Library (1921). After leaving civil service in 1922, Huntington returned to private practice and continued to design a variety of structures. Reportedly he also taught briefly at the University of Washington (1923-24). Important subsequent commissions include the DAR Rainer Chapter House (1925); the Northcliffe Apartments (1925); Fire Station No. 16 (1928); the Frederick Kirsten House (1925); and the Warren G. Harding Memorial (1925) in Woodland Park. In 1927, Huntington formed yet another partnership, this time with Longview Archibald N. Torbitt. Together the firm of Huntington & Torbitt designed the West Seattle Dairy (1927); and the Piedmont Apartments (1928) in Seattle. They also worked with local Hoquiam architect, Edwin St. John Griffith, to design the Bank of Hoquiam (1925); the Seventh Street Theater (1928); and the Hoquiam City Hall (1929). For reason unknown, the partnership was dissolved after two years, and each went their separate ways. Huntington left active practice after the onset of the Depression, although he was reportedly employed as an architect at Washington State University from September 1944 until August 1946. Following his retirement, he moved to Oregon City in 1947, but returned to the Seattle area in 1955. He died on May 13, 1962 at the age of 91. Huntington was well regarded by his business associates and professional colleagues. He was elected president of the local AIA chapter from 1918-19 and again in 1925, and was an active member of the Seattle Fine Arts Society. Huntington was a frequent speaker at a variety of social and civic club meetings. After he retired he took up painting. His oil and water color renderings were widely admired, with works show in local and regional galleries as well as in New York City.